Lethargy and weight gain are symptoms of hypothyroidism in cats, which is usually caused by overtreatment of hyperthyroidism. If your cat is being treated for this condition and is exhibiting any unusual symptoms, it's a wise idea to head to your veterinarian for an expert opinion. The thyroid glands are a pair of tiny organs located near the larynx in the neck of your cat. In all mammals, the thyroid plays a vital job in regulating the basal metabolic rate by producing a hormone called thyroxine. The most common type of feline hypothyroidism is iatrogenic hypothyroidism which is when a cat's thyroid function is too low because of treatment for an overactive thyroid. Other types that can occur are spontaneous hypothyroidism and congenital hypothyroidism. While surgery is no longer done as often as it once was, I-131 treatment is a very successful technique, and cats usually respond very well to it. After treatment for hyperthyroidism, your vet will need to monitor your cat's thyroid levels to make sure that treatment has worked. In the first few months after treatment, it is common for the thyroid levels to be below the normal range. This does not necessarily indicate hypothyroidism, but can result from any leftover thyroid cells recovering from the condition. When Is Iatrogenic Hypothyroidism Diagnosed in Cats? Cats with iatrogenic hypothyroidism and kidney disease may have longer survival rates when treated with replacement thyroid hormones. How Is Feline Hypothyroidism Diagnosed? Blood tests to measure a variety of thyroid hormones are used to diagnose feline hypothyroidism. 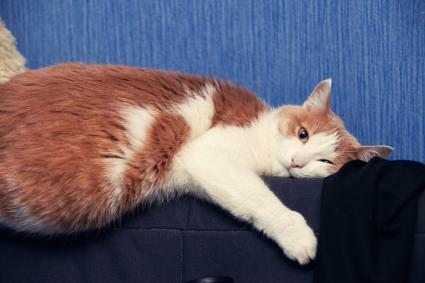 However, if your cat does not have symptoms consistent with hypothyroidism, the thyroid level can still be decreased. This is called euthyroid sick syndrome and can be seen with any other illness. Thyroid function remains normal, despite low blood levels and this does not need to be treated. If your vet suspects congenital or spontaneous hypothyroidism, more complicated hormone testing or referral to a specialist may be needed. Hypothyroidism itself is not life-threatening in cats, but can contribute to progressive kidney disease in geriatric cats. Treatment for feline hypothyroidism consists of either decreasing the medication being used to treat hyperthyroidism or supplementing thyroid hormones in cats that have received surgery or I-131 therapy for hyperthyroidism. The most common medication used is called L-levothyroxine, but can go by other names. Your cat will need to be on this oral thyroid hormone replacement for the rest of its life. The good news is that the hormone replacement therapy for iatrogenic hypothyroidism in cats will usually show signs of efficacy within a few weeks. For cats with spontaneous or congenital hypothyroidism, the prognosis is unclear because these conditions are rare.